Hello lovely people! I hope you’re all well and that you had a fabulous New Years! What did you get up to? I had an awesome night with some friends at a RuPaul’s Drag Race themed house party… we all looked hilariously bad >.< the makeup alone is so difficult to master! Anyway this was my outfit for getting some lunch and then travelling home – cosy & casual. I feel like I don’t really post any casual outfits on here (I guess because I don’t think they’re really worth taking pictures of? ), but maybe I should start. One of my resolutions this year is to try to be more active on my blog, and post some more things so this can be the beginning! I also plan on finally doing some makeup posts & some other bits too, so if there’s anything you’s like to see from me, please let me know! Do you guys have any resolutions, blog-related or otherwise? Fishnets look so good underneath those jeans! And your velvet boots are so nice. You should definitely post more casual outfits, they're good to get inspiration from! I'd also like to see a step-by-step makeup? Or what's in your makeup bag?Like your red lipstick and eyeliner always looks striking. I love seeing your more casual posts in addition to the dressier ones. Looove the way your fishnets peek over your waistband! Being more active on my blog is definitely a new year's resolution of mine. Ru pals drag race sounds like the best themed party ever! love your accessories in this outfit! You look lovely, i've literally been looking everywhere for jeans like these and they're literally perfect!! red lip looks amazing on you! You look amazing ! Love how you styled the jeans ! You pull of all black so well, I think the red lip definitely finishes it off! 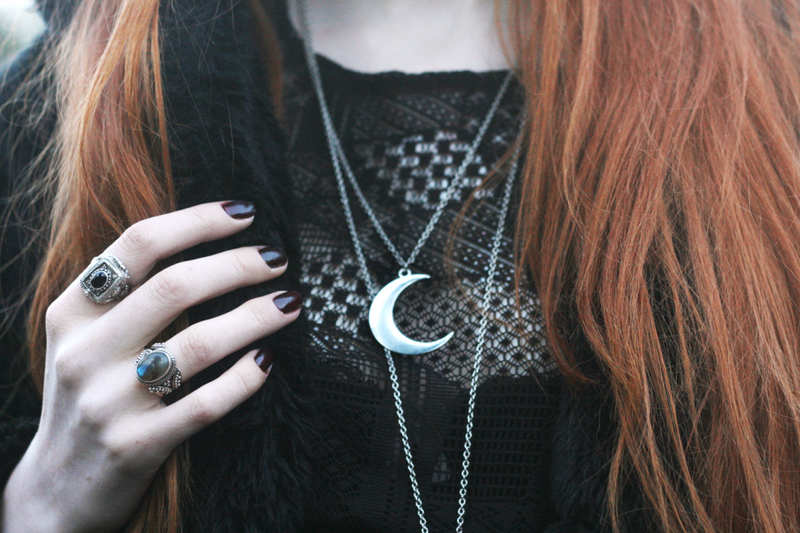 Your crescent necklace is amazing. I also love how you have layered the fish net tights underneath your jeans. I may have to re-create that, it looks awesome aha! Oh my God, why you are so gorgeous?! Your style is the best! All black everything!! The style is insane!! You look incredible, as usual! – I'd definitely love to see some makeup posts, too. Your lips are always immaculately lacquered!